We examined the effects of probing human color mechanisms using sinusoidal spectral power distributions (SPD’s) varying in frequency (i.e., from 0.1 to 5.0 cycles/300 nm for a constant starting phase) and phase (i.e., from 0 to 360 deg for a fixed frequency of 1 cycle/300 nm) through computer simulation using several color models. Predicted modulation sensitivity functions (MSF’s) in spectral frequency and phase differ among the models and indicate that measurements of the minimum amplitudes necessary to detect sinusoidal SPD’s would be useful for distinguishing among theories of color vision. MSF’s obtained from similar analyses of dichromats’ color mechanisms reveal characteristic patterns of modulation sensitivities and suggest that such measures could serve to distinguish type and degree of color-vision defect. 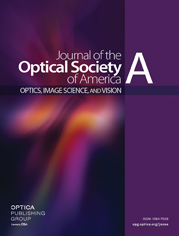 Some implications based on sinusoidal approximations to illuminant and reflectance spectra are discussed along with more general considerations regarding sine-wave SPD’s as a probe for mechanisms of color vision.